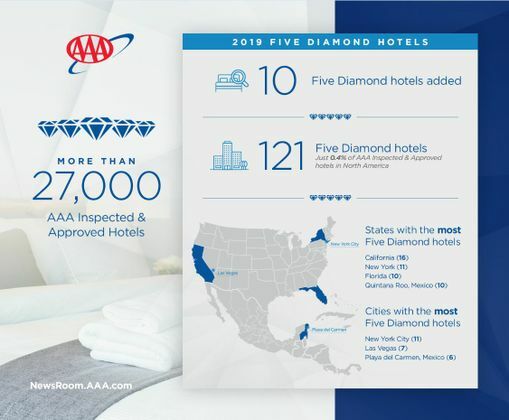 With the addition of 10 new properties, AAA has unveiled the coveted 2019 Five Diamond Award list totaling 121 hotels, including the Post Oak Hotel in Houston and Hotel Emma in San Antonio. This exclusive group represents just 0.4 percent of the more than 27,000 AAA Inspected & Approved hotels across North America. “The Five Diamond Rating is an impressive accomplishment that recognizes the finest of hotels. We are excited to add two Texas hotels to that list where travelers will find extraordinary physical qualities, extensive amenities and impeccable standards of excellence in delivering a highly personalized experience,” said Kent Livesay, Vice President & General Manager, AAA Texas. The Post Oak Hotel at Uptown Houston (Houston, Texas) – Houston's premier property offers its guests impeccable service and highest quality amenities. This contemporary hotel is a crown jewel among the city’s accommodations. The Dominick Hotel (New York, New York) – With stellar views of the city, this bastion of contemporary luxury features swanky modern Italian furnishings, impressive artworks and marble bathrooms. The SoHo location puts you at the very heart of Manhattan's fashion culture.